Looking For Fine Dinnerware That Lasts, Singapore ? 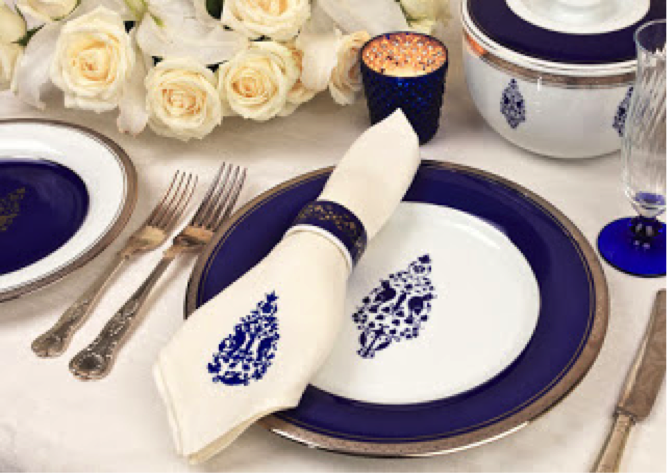 The Sandalwood Room from Singapore brings Nishita Fine Dinnerware, resistant to chipping and scratching. With handcrafted embellishments for their discerning customers. Do you remember how fiercely your mother and grandmother guarded their fine china, from the clumsy men and the careless brats of the house? And from the hands of the maids, who thought the dinnerware was merely plates and bowls to eat from? You are likely to do the same. When you become the proud owners of Nishita Fine Dinnerware. I can already picture some of you running your hands fondly over your dinner plates, as you unpack your purchase. Anything so fine deserves a celebration and I can’t think of a better way than having people over. Conversations, aperitif wine, canapés, your favourite music and a lot of laughter. Sounds like perfect accompaniment to a dining table, so well laid. So what first draws us all while shopping are the looks. With Nishita Fine Dinnerware, the elegant and unique designs arrest your eyes. I cannot but notice the exquisite artistry and workmanship, that gives a touch of class to their porcelain. Attention to detail is so evident and a closer look tells me the motifs are handcrafted. Making them timeless. Little wonder then I thought, that The Sandalwood Room displays them so proudly. There is another buyer by my side now, one of those that leaves nothing to chance. I listen, as this smart staff of The Sandalwood Room explains how the use of Japanese technology gives the dinnerware a smooth, flawless glaze and refined translucency. The Japanese are masters at giving porcelain ware strength, hardness and toughness, which also explains for the dinnerware being resistant to chipping and scratching. I hear the girl quoting Nishita Thakurdas, “An uncompromising attention to detail, quality and craftsmanship is the cornerstone of my dinnerware,”. 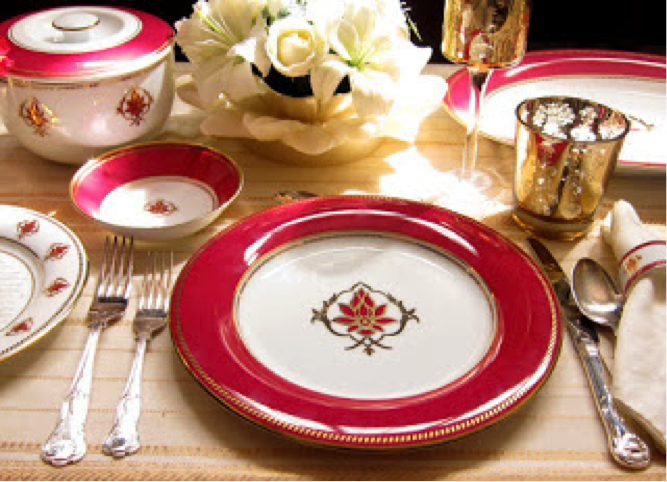 Nishita Thakurdas is the founder of Nishita Fine Dinnerware. “Every individual piece has been handcrafted creating a harmony of elegance, artistry and impeccable quality”. I accompany the buyer and we are both mesmerized by the sheer beauty of the Nishita Collection. ‘The Lotus at Fatehpur’ and ‘Jodhpur Evenings’. I am sure your guests will spend time admiring this splendid collection, before they help themselves to your delicacies. Reflecting the grandeur and richness of the Moghul era of ancient India, the collection seems like an homage to the majestic abode of emperor Akbar, in Fatehpur Sikri. Your guests may want to ask you more about the glory of Akbar – you can send them this link. 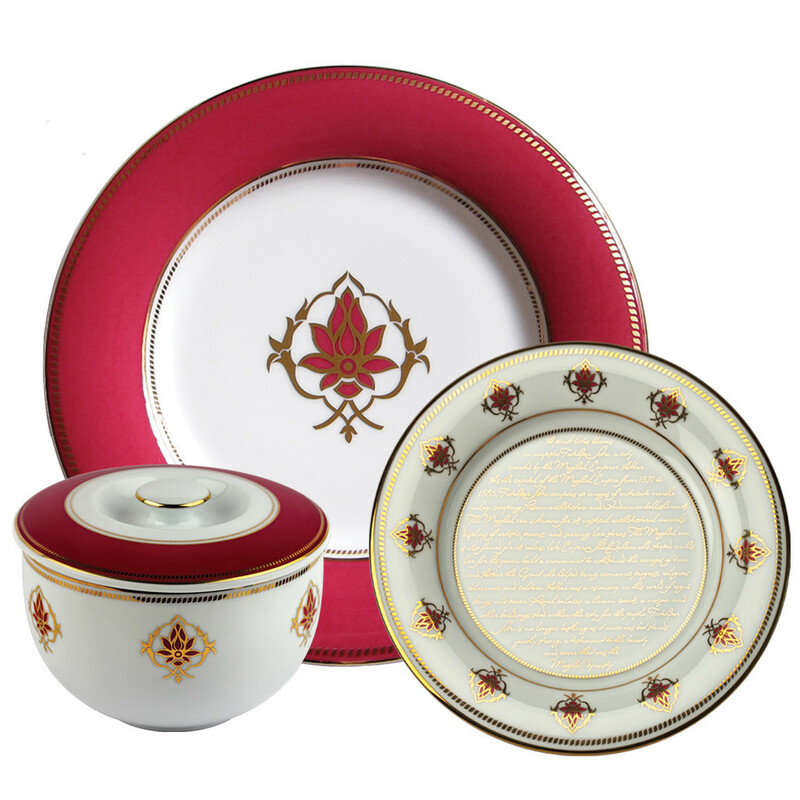 Each piece of the dinner set is handcrafted and embellished with 24k gold and luxurious crimson against pristine white porcelain, telling the tale of the Mughuls’ love for everything resplendent. The city of Fatehpur Sikri has most of its buildings in red stone and so is the symbolic use of red in this collection. The regal power of royal blue is timeless across all regions of the world. A romantic dinner for two, or a gala soiree, food certainly may taste better when eaten out of such a stylized collection. Intricate platinum edges crowning deep blue fit for royalty. Undertones of pure platinum making it perfect. Watch your guests delight in the deep blue, the delicate arcs, the hidden hearts and the sweetly whispering birds. The Jodhpur Evenings series brings together strength and softness. Just like the Blue City , Jodhpur in Rajasthan, after which the collection has been named. The complete dinner set comprises of 27 pieces – 6 dinner plates, 6 side plates, 6 bowls, 6 napkin rings, 2 serving bowls, and 1 platter. We are surprised to hear that Nishita Fine Dinnerware is long-lasting. But then, so much care and detailing has gone into turning out such irresistible pieces, why would they not make them sturdy? We are then told by The Sandalwood Room that this fine dinnerware, like all things fine, needs tender care. Sturdy it is, yet cannot be microwaved and dishwashed due to the gold and platinum ornamentation in it. We thought we should tell you this. After all, you are going cherish Nishita Fine Dinnerware. Click here for complete care instructions. The Sandalwood Room, popular in Singapore for all that is handcrafted yet global, has now moved to Tras Street. A new location, but the same beautiful ambience. For Couture, Jewelry, Art, Home-décor, Gifts & Collectibles.